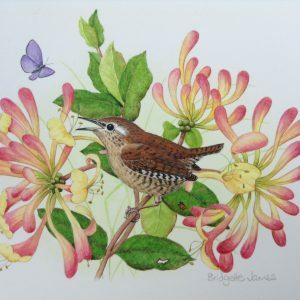 Growing up in rural East Anglia, Bridgette James’ affection for the flowers and insects of the hedgerows led her to take up a career as a professional artist in 1987. 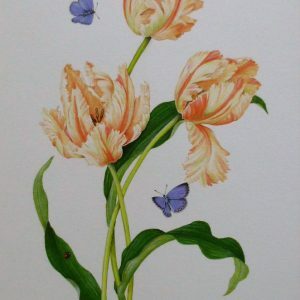 Her detailed botanical watercolours are often accompanied by dragonflies and native British butterflies in which she has a special interest. 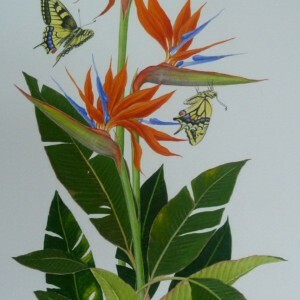 Her illustrations have been included in the Puffin Factfinders series, Readers Digest publications and in magazines produced by Orbis Publishing ltd and Eagle Moss Publications ltd.
Bridgette was invited by a patron in the Middle East to paint a botanical study in 1992; this has led to a further 50 commissions for his private collection. 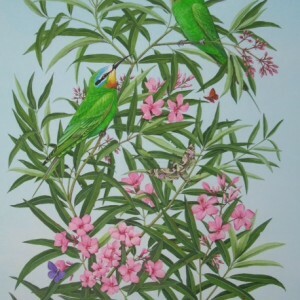 Two large wall panels showing Palm Trees painted by Bridgette are displayed in the Sharjah Desert Park Natural History Museum in the United Arab Emirates. 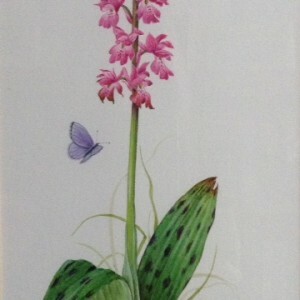 She was elected to become a member of the Society of Botanical Artists in 1993. 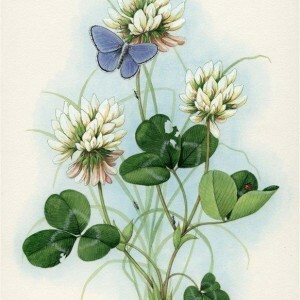 In 1995, Bridgette was commissioned to design a set of telephone cards featuring ‘Wild Flowers of St Ouen’ for Jersey Telecom. Her illustrations of lobsters and crabs are included in the ‘Collins Pocket Guide to the Seashore of Britain and Northern Europe’ published in 1996. 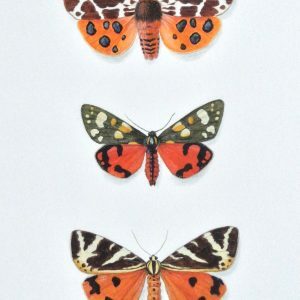 Other illustrations are included in ‘Plants to Transform your Garden’ (Cassell), ‘My First Encyclopedia’ (Kingfisher/la Rousse), Center Pares ‘Plant Life, Flower Power’ seed booklet, and ‘Find Out More’ (Eagle Moss), a children’s encyclopedia. 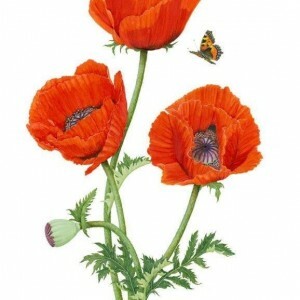 American publications include the Disney Encyclopedia (World Books Chicago), ‘Children’s Guide to Insects and Spiders’ (Simon & Schuster, New York), ‘Modern Biology 1999’ (Morgan Caine), ‘The Art of Botanical Painting’ (Harper Collins) and ‘A History and Dictionary of British Flower Painters 1650-1950’ by Josephine Walpole. 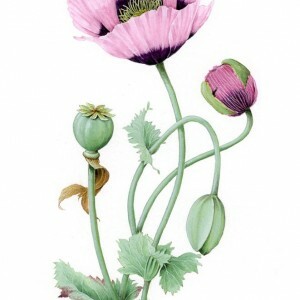 Bridgette has exhibited annually at the Society of Botanical Artists exhibition at the Westminster Gallery, and at the Society of Wildlife Artists exhibition at the Mall Galleries in London. 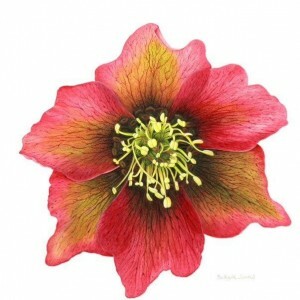 She has also held solo exhibitions at the Alpine Gallery, London, The Wildlife Gallery, Lavenham, Suffolk, The Country Works Gallery, Montgomery, Wales, and The Napier Gallery, St Helier, Jersey. 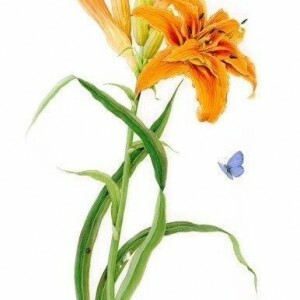 In 1997 Bridgette exhibited at the John Innes Centre and in 1998 she was a participant in the Phillips ‘Rhino Rescue’ charity auction in London. 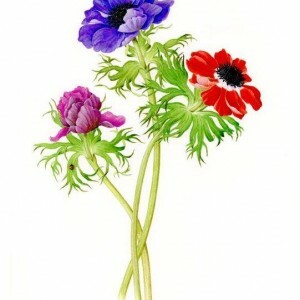 She was commissioned to illustrate ‘The Wildlife Trusts Guide to Wild Flowers’ (New Holland Publishers UK ltd) which was published in 2002 and reprinted in 2006 and 2008. 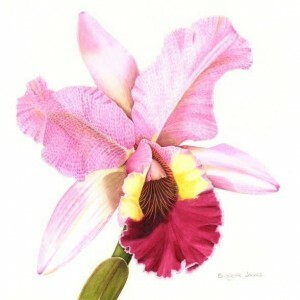 During 2008 Bridgette illustrated the Guardian/Observer Guides to Grow Your Own Fruit and Vegetables. 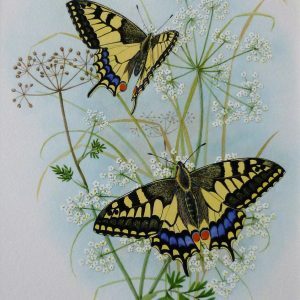 Her extensive range of greetings cards have been sold internationally and her paintings are in private collections in the Channel Islands, Australia, Ireland, Germany, Italy, Oman, Spain, Denmark, Turkey and the USA. In 2010 Bridgette illustrated the Wildflower Detectives’ Handbook which was endorsed by the Wildlife Trusts and published by Miles Kelly. 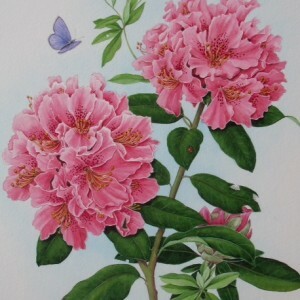 This painting is available and currently on show in the gallery.